True. The one universal quality of ventriloquism is humor. (Yes, Hollywood has produced some twisted movies containing humorless ventriloquism, but they’re not one of us!) Even when the subject of your program is serious, tasteful humor makes the message more effective. False. Never use a joke that is not funny in your mind. However don’t pass judgement on a joke too quickly. Some poorly written jokes can be made humorous through creative rewriting. False. Begin with strong material to get the show rolling! Unless your ventriloquist technique is truly outstanding and you have creative writing skills to match, keep the conversation moving with lines that are short, crisp and concise. Maybe – maybe not. We have witnessed wonderfully entertaining shows where the ventriloquist figure carried the majority of the conversation. They are the exception, however, not the rule. For the beginner, we recommend shorter lines for the ventriloquist figure or puppet. False. It is perfectly acceptable for an encore to continue the program’s theme. It’s just not mandatory. True. Just wait and see for yourself! If this statement seems a true description of your experience, find ways to build fresh enthusiasm and expression into the routine. Practice is valuable; too little is far more risky than too much. Memorization is good. Recitation is not. Keep the delivery believable and fresh. The routine may be “old hat” to you, but each audience is new. Use them as your inspiration! 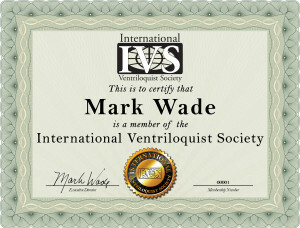 Are you ready to join the IVS and become a part of the only international organization for ventriloquists? In addition to your membership package, the IVS publishes an on-line newsletter, The IVS Spotlight, four times a year. Each issue is packed with information on ventriloquism from around the globe. We also include tips, videos and articles from top ventriloquists to help make you a better performer.